Background: Cocacola is the third most valued brand after Apple and Google, based on the study of Interbrand’s “best global brand” study of 2015. After the creation of formula of new drink in 1886 an effective name was required for the drink. The words “coca cola” came into existence in 1887 thinking that “the two Cs would look well in advertising.” From its existence in 19th century, coca cola has changed trademark about 11 times in 130 years but the value of brand has increased tremendously. Lawsuit: Coca cola recently filed a trademark suit against Harris International, makers of Riham Cola on in 2013. The Coca-Cola Company counsel accused that Riham Cola made in Uganda had similar color and packaging to that of coca cola which misleads the end product user. Riham was also accused of deliberately trying to create confusion amongst the masses by misleading advertisement and promotions of the product. The coca cola company finally settled the case on 5th November 2013 terms of which were kept confidential. Background: Champagne an alcoholic drink which came into existence in 17th century produced from extracts of grapes. These grapes are grown in specifically designated plots in Champagne region of France. It is legally protected in European countries and many other countries since 1891 treaty which was reaffirmed in treaty of Versailles. US have also banned the use of this term on labels on all the wines manufactured after 2006. The European union also prohibited the use of terms “Champagne Method” and “méthode champenoise”. Champagne has been protected under Geographical Indication laws and trademark law. Various law suits have been filed in most digressive ways by CIVC against companies, people and products. Lawsuit: A case was filed against Champagne Jayne(real name Rachel Jayne Powell) for trademark infringement over the use of word champagne in her name. She was accused for damages in the goodwill of the champagne brand. It was concluded in 2013 that it was likely to mislead or deceive the use and promotion of sparkling wines. Champagne Jayne got to keep her domain, facebook and twitter accounts as such. Also, there were no restrictions imposed on her for sponsorship and approval of her company’s products from CIVIC body. In another case, a case was filed against Aldi Süd owner of Champagne Sorbet in 2012 to prohibit them from sale of products under that name. 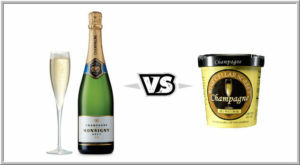 The judgment was passed in favor of Champagne Sorbet by keeping in mind the “taste-element”. As champagne sorbet was a type of ice cream which contained 12% champagne where as Champagne was provided PDO’s (Protected Designation Origin) status. Background: Prosthetic vascular grafts used to bypass or replace clogged blood vessels. The longest patent battle ever, start of this saga was marked in 1974 and finished with Federal Circuit’s decision in patent owner Bards favor. An application filed for vascular graft in 1974 by Goldfarb was issued in 2002. This patent focused on the solid nodes of PTFE used to make the graft. Spongy tube with spaces for cells to grow into graft and integrate it into body. The consistency and the distance between nodes were the most important aspects of this invention. Lawsuit: This graft technology was developed in collaboration between Cooper, who was working at W.L. Gore, and Goldfarb, the Director of Research and a Clinical Staff Surgeon at the Arizona Heart Institute. Both of the inventors filed separately for the invention which led to interference with each other. Goldfarb was awarded the patent since he recognized the optimum distance of the graft for production. In 2003 lawsuit filed against W.L.Gore jury awarded $102 million in lost profits and $83 million in reasonable royalties to Bard and set a running royalty rate of 10% for any future infringement. After this several cases were filed by WL Gore against Bard. Recently in 2015, W.L.Gore petition was rejected by the court. Background: Harry Potter a series of fantasy novels, since the release of first novel in 1997 has gained popularity and film series have also been made on the same. Harry potter novel describes a story of young wizard who enrolls in the wizardry school. The story revolves around Lord Voldemort trying to secure the power and overthrow the ministry of magic, harry tries to defend the school of wizardry. The books have sold more thatn 500 million copies till 2013 and have been translated to seventy three languages. Its writer J.K.Rowling and publishers have taken various legal actions to protect their copyright. Lawsuit: Steven Vander Ark’s ‘Harry Potter Lexicon’ began work on his Web site in 1999 and launched it in 2000.Although, lexicon referenced it but too much data was directly copied from the original copy. Therefore a judgment was ruled out that Harry Potter lexicon was doing irreparable damage to Rowling and Warner Bros. Harry Potter lexicon was permanently banned and $6,750 were awarded as statutory damages. Background: Reckitt Benckiser Group plc (RB) is a multinational FMCG company. A whole range of products veet, mortien, air wick, durex, lysol,etc are sold by RB. Veet was globally accepted as the brand name in year 2002. It is a trademark of internationally sold product by RB consists of a hair removal compound and an s-shaped spatula for its application. Reckitt has a design patent no. 193988, dated 5th December 2003, in Class 99-00 for the s-shaped spatula that is used to apply hair removal cream. Lawsuit: On 8th October 2010, Reckitt Benckiser Group(India) filed a design patent infringement case against Wyeth. An obvious or fraudulent imitation of Reckitt’s designed spatula was done by Wyeth for Anne French hair-removing cream. On 15th March 2013, Division bench found that existence of prior art as the spatula in question was found in actual use prior to registration. The court directed both parties to appear before the Single Judge on the 17th April 2013, for further proceedings.